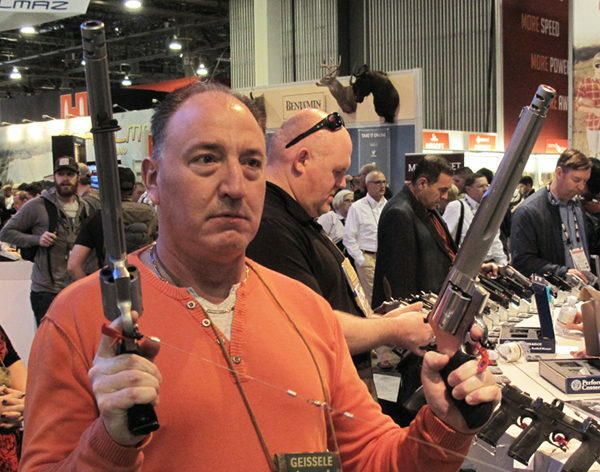 When covering SHOT Show 2019 our reporters focused primarily on rifles, optics, and reloading equipment, because this website is dedicated to rifle accuracy. However we know many of our readers are interested in pistols and revolvers, and we bet the majority of our Forum members own handguns. This Editor used to compete in IDPA and other pistol disciplines and I still love my semi-autos and wheelguns. For you pistoleros, here are five videos covering some of the best new handgun options for 2019. The first video in the list covers multiple handguns — four recommended 1911-type pistols. Enjoy. This 12″ Bullseye Pistol Diagnostic Target helps improve handgun marksmanship. The target diagnoses common problems based on shot impact zones. While this target is designed for righties, left-handed shooters can use the target too. Just observe the opposite tips. Share the post "What’s HOT from SHOT — Handgun Video Showcase"
Jessie Harrison — one of the greatest female pistol shooters on the planet. In the video below, Jessie offers good tips on safe handgun mag changes. One of our Forum members asked: “Are there any good books on pistol marksmanship? I’m looking for a book that covers techniques and concepts….” Here are six recommended titles that can make you a better pistol shooter. These books run the gamut from basic handgun training to Olympic-level bullseye shooting. There are actually many good books which can help both novice and experienced pistol shooters improve their skills and accuracy. For new pistol shooters, we recommend the NRA Guide to the Basics of Pistol Shooting. This full-color publication is the designated student “textbook” for the NRA Basic Pistol Shooting Course. Serious competitive pistol shooters should definitely read Pistol Shooters Treasury a compilation of articles from World and National Champions published by Gil Hebard. You could work your way through the ranks with that book alone even though it is very small. It is an excellent resource. If you’re interested in bullseye shooting, you should get the USAMU’s The Advanced Pistol Marksmanship Manual. This USAMU pistol marksmanship guide has been a trusted resource since the 1960s. Action Shooters should read Practical Shooting: Beyond Fundamentals by Brian Enos, and Practical Pistol by Ben Stoeger. Brian Enos is a well-known pistol competitor with many titles. Ben Stoeger is a two-time U.S. Practical Pistol shooting champion. Last but not least, Julie Golob’s Shooting book covers pistol marksmanship, along with 3-Gun competition. Julie holds multiple national pistol shooting titles. Share the post "Six Great Guidebooks for Pistol Shooters"
Share the post "Hot Handguns — Best Selling Semi-Auto Pistols and Wheelguns"
Share the post "Crowd-Pleasers: Best-Selling Pistols of 2018"
Photo courtesy DougKoenig.com and Leupold. Since the Bianchi Cup, the most prestigious pistols-only match in the country, starts today, we thought we’d post some videos that can help readers improve the speed and accuracy of their pistol shooting. You may never win a Bianchi title, but these tips can help in a club IDPA match, or the pistol stages of your next 3-Gun match. The star of these videos is Doug Koenig, 18-time Bianchi Cup champion. Koenig, who has won numerous National and World pistol titles, is considered by many to be the best action pistol shooter on the planet. His speed, consistency, and accuracy are without peer. In this next NSSF Video Koenig demonstrates how to make Fast Follow-Up Shots and how to transition from target to target quickly. Grip, stance, consistency are all important Doug explains. When shooting a pistol two-handed, “on the clock”, it’s almost always better to shoot with both eyes open. And during a “move and shoot” action pistol match, you surely want to have both eyes open. Keeping both eyes open improves depth perception and helps with target transitions. With both eyes open you’ll have better depth perception and peripheral vision, Koenig says. Moreover, you will also be able to transition from target to target more quickly. In a timed, multi-target stage, you’ll want to move your head/eyes to the next target right after you break a shot. You’ll find that you will then reflexively move the handgun on to the new target when you swing your vision on to it. Don’t linger on the target you just shot — move to the next. In this fourth video, Koenig talks about key techniques that apply to all pistol marksmanship — not just speed shooting “on the clock”. With any handgun, Doug explains, you should focus on consistent trigger control. You want to avoid yanking the trigger or anticipating recoil. Share the post "Koenig Explains How to Shoot Pistols Faster and Better"
OK this is no novice. But even champion pistol shooter Jessie Harrison, Captain of Team Taurus, had to start with the basics. Jessie says that safety should always be your number one priority. At AccurateShooter.com, our primary focus is precision target shooting with rifles. But it’s definitely fun to shoot pistols too, and we bet most of our regular readers own handguns. Here are six tips for shooting safely and accurately with handguns. These pointers will help you advance your skills and have more fun with your pistols and revolvers. Whether you own one gun or one hundred, gun safety must always be your main priority. In this video, Smith & Wesson Team Captain Julie Golob covers the basics of gun safety. We strongly recommend that new pistol shooters start off with a .22 LR rimfire handgun. The .22 LR cartridge is accurate but has very low recoil, less “bark” than a centerfire, and very little smoke and muzzle flash. New shooters won’t have to fight muzzle flip, and won’t develop a flinch from the sharp recoil and muzzle blast common to larger calibers. With the .22 LR, the trainee can focus on sight alignment, breathing, and trigger pull. When he or she has mastered those skills, move on to a .38 Special or 9mm Luger (9x19mm). What gun to use? We recommend the 10-shot Smith & Wesson Model 617. Shooting single action, slow-fire, this is ideal for training. 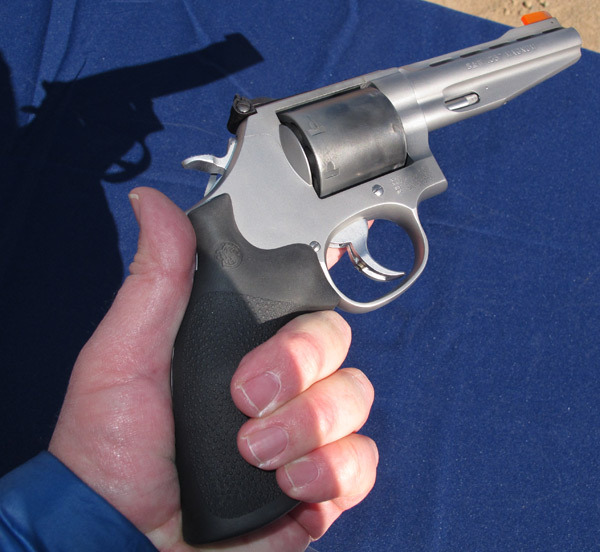 Shown above is the 4″-barrel Model 617version which balances well. There is also a 6″-barrel version. It has a longer sight radius, but is a little nose-heavy. Both are great choices. They are extremely accurate and they boast a very clean, precise trigger. If you prefer a semi-auto .22 LR pistol, we recommend the Browning Buck Mark series. Buck Marks are very accurate and very reliable. This rimfire pistol is available in a variety of models starting at under $350.00. Like the S&W Model 617, a good Buck Mark will serve you for a lifetime. It’s common for new pistoleros to start shooting at cans or clay birds at a public range. That can be fun, but it’s better to start with proper targets, placed at eye level, at 7-10 yards. We like to use targets with large, brightly colored circles. Focus on putting 5 shots in a circle. We recommend targets that have multiple bullseyes or aiming points — that way you don’t have to constantly change your target. There are also special paper targets that can help you diagnose common shooting problems, such as anticipating recoil. EZ2C makes very good targets with bright, red-orange aim points. You can also use the bright orange Birchwood Casey stick-on Target Dots (right). These come in a variety of diameters. We like the 2″ dot at 10 yards. We recommend that new pistol shooters begin their training at an outdoor range. There are many reasons. First, the light is better outdoors. Indoor ranges can be dark with lots of shadows, making it harder to see your target. Second, sound dissipates better outdoors. The sound of gunfire echoes and bounces off walls indoors. Third, an outdoor range is a more comfortable environment, particularly if you can get out on a weekday morning. Indoor ranges, at least in urban areas, tend to be crowded. Many also have poor ventilation. If you can make it to an outdoor range, you’ll be happy. Many outdoor ranges also have some steel pistol targets, which offer a fun alternative to paper. When shooting steel however, we recommend polymer encased or lead bullets to avoid ricochets. Photo courtesy AV Firearms Training. Too many new pistol shooters try to move right to rapid fire drills. It’s better to start slow, practicing the basics, under the guidance of a good mentor. If you belong to a club, ask if there are certified instructors who will help out. This Editor learn pistol shooting from a seasoned bullseye shooter, who got me started with a .22 LR revolver and very close targets. Over the course of a few range sessions we progressed to farther targets and faster pace. But the fundamentals were never forgotten. When starting your pistol training, it’s wise to view some instructional videos. Top Shot Champion Chris Cheng hosts an excellent Handgun 101 Series produced by the NSSF. We’ve linked one of these Handgun 101 videos for Tip #6. When you learned to ride a bicycle, you started slow — maybe even with training wheels. The same principle applies to pistol shooting. When you get started with handguns, we recommend you shoot slowly and deliberately. Start with the handgun unloaded — just work on your sight alignment and breathing. With snap caps in place, try some dry-firing drills. Then progress to live fire. But be deliberate and slow. With the target at 20 feet, see if you can get three successive shot-holes to touch. Believe it or not, many common pistols are capable of this kind of accuracy (but you won’t see many shooters at indoor ranges who pursue that kind of precision). Once you master your form and accuracy, then you can work on your speed. Share the post "Six Tips for Novice Handgun Shooters"
When shooting pistols do your shots normally land smack dab in the middle of the target? If not, you may have some technique problems that are causing your shots to move off center. Top Shot Champion Chris Cheng has produced a good video for the National Shooting Sports Foundation (NSSF) that helps handgunners diagnose accuracy issues. By shooting 3-shot groups and looking at the pattern and location of the shots, you can see what you’re doing wrong (or right). Here are some examples. Note, this process works best for shooters whose shots fall typically in one target zone. If your shots are all over the target, your form is inconsistent and problems will be harder to diagnose. 1. Low Left — Jerking Trigger: Here we see three (3) shots at the 7 O’clock position. This shows that the shooter is jerking the trigger, meaning that the shooter is pulling the trigger too quickly and therefore forcing the barrel to drop when breaking the shot. This is a very common problem, particularly with novices who are reacting to the noise/recoil of the pistol. 2. 9 O’Clock — Too Little Trigger Finger: If we see three (3) shots at the 9 O’clock position, what this can be indicative of too little trigger finger on the trigger. And therefore with every shot, the shots are getting pushed to the left. Try moving your trigger finger on to the pad of your index finger. Also try dry firing drills. 3. High Left — Anticipating Recoil: In this next example, we see three shots around the 11 O’clock position. What could be happening here is that the shooter is anticipating the recoil, and is actually lifting the gun up when he shoots. We recommend slowing down, working on your breathing, and, again, do dry-firing drills. 4. 3 O’Clock — Too Much Trigger Finger: Finally, if you see three (3) shots at the 3 O’clock position, this can indicate that there is too much trigger finger on the trigger. Therefore when the shot breaks the shooter is pulling each shot to the right. Note: Each of these descriptions is for a RIGHT-handed shooter. If you are a left-handed shooter you’ll want to reverse those descriptions. Share the post "Handgun Marksmanship — Diagnosing Pistol Accuracy Problems"
Ruger is working to get new people involved in shooting sports through a new 10-part video series. Ruger’s American New Shooter Academy focuses on firearms safety and handgun skills training. There are ten, 5-9 minute episodes, all available now on GetZone.com and YouTube. In the New Shooter Academy series, Firearms trainer Daniel Shaw starts from “square one” with four participants with little-to-no handgun firearms experience. Shaw works with the students to build good fundamentals and follow recommended safety procedures. “Recruiting new shooters and making sure they are properly trained is critical to the future success of shooting sports” said Jeff Siegel, CEO of Media Lodge, the company that produces the videos for Ruger. During their training sessions, participants used the Ruger American Pistol compact model chambered in 9mm Luger, with a manual safety. Additional products for the series were provided by CrossBreed Holsters®, TMG Target Systems, and Hornady. Share the post "Ruger Offers Ten Training Videos for New Shooters"
Do you shoot a .45 ACP? We love this short, fat cartridge because it is inherently accurate, it makes big, easy-to-see holes in paper, and because it it works so well in the classic 1911 series of pistols. It is hard to beat a good, tuned model 1911 when it comes to trigger pull/reset and natural pointing ability. Share the post ".45 ACP Quick Guide — Reloading and 1911 Field Stripping"
RCBS just kicked off its best rebate program of the year. The Holiday 2017 Buy Green Get Green promo is simple — buy ANY RCBS product over $49.99 and you qualify. There’s no restricted list of “qualifying” products. The more you spend, the more you get back — up to $175.00 total. If you are considering purchasing a single-stage press, electronic powder dispenser, progressive press, or a full reloading kit, save big with this promotion. It is good for purchases made through the end of the year, December 31, 2017. Download REBATE Form HERE. This may be the best pistol deal of the year. Right now Brownells.com is selling the Remington RM9 for just $299.99. NOTE: This item shows out of stock, but you can back-order the Rem RM9 and still get this price. But there’s more! You can get another $100.00 off with Remington’s Pre-Black Friday Rebate Program for pistol purchases made now through November 18, 2017. So you can get this brand new 9x19mm full-size, polymer-framed pistol for just $199.99. Plus if you use Brownell’s Coupon Code “H7L” at check-out, you’ll save another $20.00 and get free shipping. That lowers your actual cost for the RP9 pistol to $179.99, or $189.99 including Brownells $10 FFL processing fee. A new pistol for $189.99 is a heck of a deal. GET Remington Rebate Form. At the recent IBS 600-yard Nationals, 4 of the Top 10 shooters (including the 2nd-place finisher) used Sightron 10-50X scopes. Though reasonably priced, this 10-50x60mm optic is definitely good enough to win long-range benchrest and F-Class matches. If you’re looking for a high-magnification, variable-power target scope (with 1/8 MOA clicks), the Sightron 10-50x60mm is a smart choice. There is nothing else at the $1000.00 price point that can touch it. The new Nightforce 15-55x52mm Competition Scope is a great product, but it costs $2352.00, more than TWICE the price of the Sightron 10-50x60mm. The money you save (vs. 15-55X NF) could pay for four barrels or a custom action. On a value-for-money basis, then, the Sightron 10-50x60mm makes sense for competitors on a budget. NOTE: Other Sightron 10-50x60mm scopes with FCH, Mil-Dot, or Target Dot reticles run $1000-$1030 on Amazon. Here’s a very cool product from MTM at a great price. The versatile MTM AC4C Ammo Carrier features four, lockable polymer ammo cans in a fitted, four-slot 23.5” x 11.3” x 7.5” carry crate. This makes it easy to haul four full ammo cans. Actual purchasers have raved: “Moments after I received this storage box set I ordered another. Very well built and great design. Awesome and a steal at the price.” Right now this is on sale at Amazon for just $29.99 with free prime shipping. The system includes four lockable, O-Ring 11.3″ x 7.2″ x 5″ ammo cans (AC30T) for multi-caliber ammo storage. The crate even includes tie-down points for transport in a cart or ATV. NOTE: Earlier this summer this MTM AC4C system sold for $39.99. The current $29.99 price represents a 25% savings! See price chart below. The Ruger LCP is the #1-selling pistol in the USA according to Gun Broker. And now you can get this compact carry piece for just $169.00 at Bud’s Gun Shop. Great deal. The Ruger LCP is light (9.6 ounces) and compact (5.16″ OAL), so you’re more likely to carry it regularly. The .380 ACP cartridge is not as powerful as a 9x19mm or 40 S&W to be sure, but when your life is on the line, a small gun is certainly better than no gun. For those looking for a light-weight, easy-to-conceal handgun, this little Ruger is a solid choice. Owner reviews have been positive and the $169.00 price (with free shipping) is hard to beat. That’s for payment via money orders, checks, or echecks; credit card price is $174.07. Rebate Extended to December 31, 2017! Here’s a great Rebate offer from Federal Premium Ammunition. Now through December 31st, 2017, you can get 25% OFF the cost of Federal American Eagle brass-cased pistol ammo. We’ve used this ammo in .380 ACP, 9mm Luger, .40 S&W, and .45 ACP and we can say it’s good stuff — very reliable and cleaner that some other less-expensive brands. Midsouth Shooters Supply has qualifying American Eagle Ammo in a variety of calibers: .25 ACP, .380 ACP, 9mm Luger, .38 SPL, .357 SIG, .357 Magnum, 40 S&W, .44 Rem Magnum, .45 ACP. Midsouth’s American Eagle Ammo starts at $11.99 for 50 rounds of 9mm Luger. The 25% OFF Super Savings Rebate reduces the price to just $8.99 per 50-ct box. CLICK HERE for Rebate Form. This Outers-brand, 51-piece set contains all the drivers you could ever need: Flat-head, Phillips, Hex (Allen), and Torx. Priced under ten bucks, this driver set offers great value for the money. Even if you already own high-quality Allen and Torx wrenches, you can buy this as a spare set for your gun room. And this also makes a great holiday “stocking stuffer” for gun guys. These drivers work great for installing scope rings or bases, or everyday use around the home. Share the post "Bargain Finder 111: AccurateShooter’s Deals of the Week"
Story based on report by Ammoland.com, under Creative Commons License: Attribution. While California politicians are doing everything possible to strip citizens of their gun rights, things are different in Texas. Very different. Shooting is big business in Texas. Witness the latest shooting facility being built in the Lone Star Star: “The Gun Range”. Under construction now in Killeen, Texas, this 15,000-square foot facility will have 16 indoor shooting lanes. It will even have a “Virtual Reality” room where you can shoot bad guys. The total cost for this state-of-the art shooting range? A cool four million dollars ($4,000,000). Construction is already underway on “The Gun Range”, set to open in the Spring of 2018. The new facility will feature four 50-yard general purpose lanes plus twelve 25-yard pistol lanes, all equipped with advanced Target Retrievers. A new high-tech feature at the range will be a virtual reality projector that uses a real gun to shoot the “bad guys”, but without shooting real projectiles. Other features include a full snack bar, and TV Lounge. The Gun Range will offer online reservations for gun safety courses, range sessions, and appointments for large parties. “This… will also be a great place for date nights too,” said The Gun Range owner Paul Doyle. COMMENT: Only in Texas would they think of going shooting on “Date Night”. We love it. The new $4 million Killeen Gun Range will be located at 2401 South Fort Hood in Killeen, home of the Fort Hood Army base. Fort Hood is the most populous army base in the world — roughly 88,000 active duty personnel live in the immediate area. When complete, “The Gun Range” will be the most modern shooting range to serve army personnel and the local population. Killeen currently has another 10-lane, 15,000 sq.ft. facility, the Mountain Creek Range, on the south side of town. Share the post "New $4 Million Texas Shooting Range Offers Virtual Reality"
One eye or two? That’s the question that confounds some pistol shooters, particularly during slow fire. When shooting one-handed, some bullseye pistol shooters use a piece of tape or paper on one lens of their shooting glasses to obscure their non-dominant eye. That way they can get a more precise sight picture. However, when shooting two-handed, it’s almost always better to shoot with both eyes open. And if you are doing a “move and shoot” session/match, you’ll surely want to have both eyes open. Champion pistol shooter Doug Koenig says he always shoots handguns with both eyes open: “To me it’s very simple — I wouldn’t drive my car with one eye closed. I wouldn’t walk around the house with one eye closed. To me, it’s all about your vision, your depth perception.” Doug adds that you definitely need both eyes open to transition quickly from target to target. With both eyes open you’ll have better depth perception and peripheral vision. You will also be able to transition from target to target more quickly. In a timed, multi-target stage, you’ll want to move your head/eyes to the next target right after you break a shot. You’ll find that you will then reflexively move the handgun on to the new target when you swing your vision on to it. Don’t linger on the target you just shot — move to the next. Watch Doug Koenig’s Championship Season TV show on the Pursuit Channel: Wednesday 5:30 pm (Eastern); Friday 9:00 pm (Eastern); Saturday 1:30 am (Eastern) West Coast prime-time. Share the post "Handguns 101: Shoot with Both Eyes Open"